Along with over 100 million people in the United States, my house had on the big game last night. My friend, Mitch from I’m Just Sharing blog, came by for the fun and our favorite Superbowl feast of calzones with fresh baked cookies for dessert. Watching the Superbowl. Nikon D700/Tokina 11-16mm, 1/6s, f/5.6, ISO 1600, EV 0, 16mm focal length, tripod. Today, I am basking in the glow of the win by my favorite team, the Green Bay Packers! This entry was posted in People, Sports, Weekly View and tagged family, football, friends, green bay packers, home, nfl, nikon D700, superbowl, television, tokina 11-16mm, tripod, xlv. Bookmark the permalink. Congratulations with the win Scott. I’m still so uncertain of the rules that it is minor fun watching the game. I need someone to watch it with. Would love to have you for a game, Carsten. Of course, I feel the same way when I am watching a soccer (aka football to you) match. I sure would like to watch with enthusiastic football fans. BTW, we (I) have been busy watching the world championship of handball lately. Denmark lost in the final in overtime after a very intense match against France. After all, silver is ok! Hey…thought you like the Packers? I know you’d like the food! Only football can cram 60 minutes of play time into FOUR HOURS of excruciating boredom! 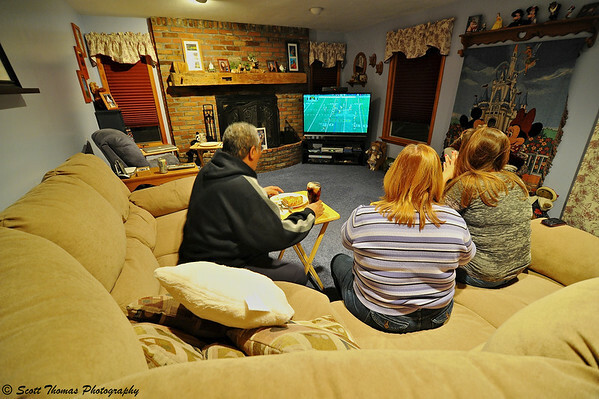 Of course the Super Bowl was on at our house, too, and I watched…. the comercials! I like your wide-angle view. Thanks and sorry it bores you. I had a lot of fun, myself. Especially, since Mitch now owes me a pizza! I think I haven’t won one since the last time the Packers won the Superbowl. Well, I’m not looking so bad from behind like that. lol Good time, good game, good food; life doesn’t get much better than that. It was such a good game even if my hometown favorites didn’t pull through. Contests on your team playing a great game! It was a very good game. With the outcome in doubt for most of the second half as the Steelers cut into the lead getting to within 3 points in the last quarter. Green Bay’s final drive won it for them. We enjoyed the Super Bowl game too, and ate our favorites such as fried chicken and tortilla chips with salsa. We rooted for the Green Bay Packers and I just knew they were going to win! Yeah!